A research team at Stanford University is pursuing a project that would allow small flying drones to meander around, identify targets, land on walls and sit there (aka hide) . Such devices deployed by a government -- or by anyone else --would facilitate surreptitious espionage, surveillance, and physical attack on ordinary citizens -- that is, on everyone. As it says in their white paper: these devices could "identify suitable locations, execute controlled, low-speed landing maneuvers on arbitrary surfaces, cling and crawl to save power while conducting surveillance, and jump to regain airborne mobility". To be "fair" to these particular researchers, this kind of development is inevitable. New technology creates new opportunities. Politics must shape and control whether these are opportunities for good or evil, opportunities to "serve mankind" for good or for supper. Alfred Hitchcock's THE 39 STEPS, one of the most entertaining shows in NY has just moved to New World Stages, 340 West 50th Street Between 8th and 9th Avenues. 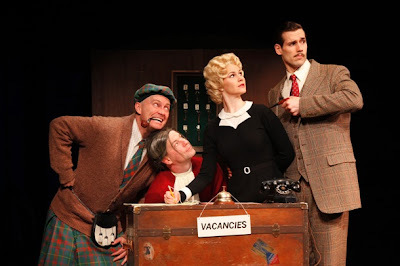 With just 4 actors, lots of wit, and frantic physical comedy, the play, 39 Steps, re-creates the classic film, Hitchcock's spy thriller, 39 Steps. The play stands on its own, a tour de force of live comedy techniques. It's not necessary to have seen the movie to enjoy the play, but for the most fun, my recommendation is, if possible, to rent/watch the movie a day or two before going to the play. Although it is available on DVD, the extraordinary cinematography creates the mood of the film. 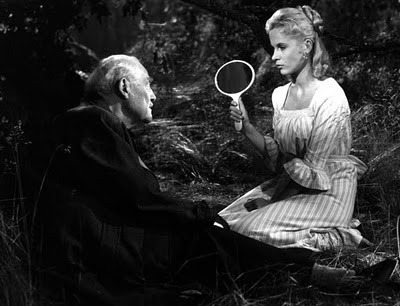 WILD STRAWBERRIES should be seen in a theater! Collected Stories, by Donald Margulies, is a classic American play. First produced in 1996, it was a Pulitzer Prize finalist, A production by the Manhattan Theatre Club in 1997 was the Drama Desk Best Play Award winner. 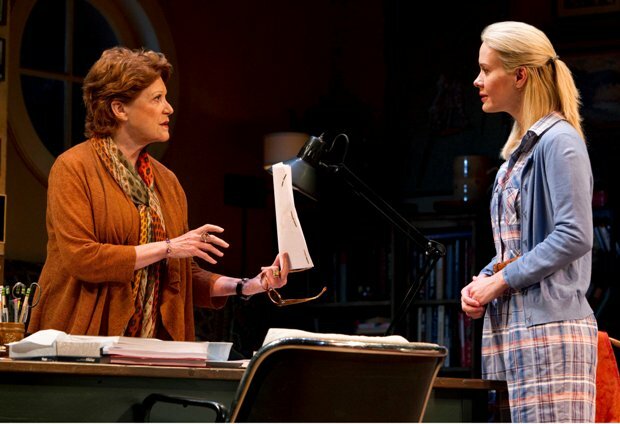 In this current limited run at The Manhattan Theatre Club, directed by Lynne Meadow, Sarah Paulson plays Lisa, at the beginning of the play a graduate student writer, who comes for a tutorial at the home of Ruth, her professor, a distinguished writer of short stories. The play describes the progression of Lisa from tentative student to assertive writer. But it's what she writes that is at issue. In the play, Ruth (a fictional character) as a young woman had an affair with Delmore Schwartz (who was a real poet) but she never wrote a story about their relationship. She tells Lisa about the affair, and Lisa (without explicit permission) secretly writes a novel about a young writer who has an affair with an older poet. The play has many themes. Three of the most prominent are: the rise of the young writer eclipsing the older, the betrayal by the young writer of her mentor by “stealing” her story – or is it stealing? And meta levels of fiction and reality in fiction which incorporates real people and places. First comes the (inevitable) rise of the talented apprentice to become the star, while the teacher grows older and fades. This theme has many antecedents in plays and films, which differ depending on the personalities of the antagonists. Here, the young apprentice is mostly sweet and helpful in person, while predatory in secret, and the older teacher fades -- mostly gracefully, up until the confrontation at the climax of the play. The second theme deals with the question of just how much of someone else's life can you appropriate in your own fiction (with the side question of whether what you write is artistic, artistically truthful, willful (or ignorant) distortion, or just plain trash). The question is both legal, and more importantly, one of trust and relationships, and of the precedence of the art of writing and the need to write over personal relationships. The second theme (and the play itself) was inspired by a real event. Stephen Spender sued (successfully, under English copyright and libel law) to suppress a novel which depicted Spender's affair with a lover in a way that he believed was libelous, and infringed on the copyright of what he himself had written. The confluence of these two themes, the change in relationship from beginning to end based on how the participants relate to each other, reminded me strongly of Mamet's Oleanna. But Oleanna is fixed on its specific issue -- how what in Act One seems like kindness from the teacher for the student, becomes in Act Two the raw material for fierce "retribution " by the student on the teacher. Collected Stories is more gentle, and deals with a broader range of issues, emotions and aspects of a relationship. The third theme is the question of how one fictionalizes a real event; a theme made especially real in this play by existing on (at least four) meta levels at the same time – mixing real people and fictional characters in the incident that inspired the play, the play itself, the novel within the play, and the story on which the novel within the play is based. Delmore Schwartz is a real person. He did drink at the White Horse Tavern (as did Dylan Thomas… and as did I, as a matter of fact, some decades after Schwartz & Dylan: the White Horse Tavern being a frequent stop for HB students to have a beer after a late class -- giving me something of a strange feeling of participation in the real events of the fictional play). 1- (The real event): We have this play inspired by a real event: in which a real person objects to a fictionalized version of himself, written without permission by another author. 2 – (The play itself): In the play, a woman (a character) writes a novel about her teacher’s affair (a character's affair) with a real person (not a character) without the teacher’s permission. 3 - (The teacher's story in the play): In the teacher’s story in the play, the poet that the (fictional) teacher has an affair with is a real poet, who really did hang out in the real place described by the teacher. 4 – (The novel in the play): In the woman’s novel, the story of the fictionalized teacher and the real poet is further fictionalized, probably differently from the way the character of the teacher remembers it, and possibly in a trashy way. There was an after-theater discussion (I don't know if that happens every night) with the audience and a facilitator (neither the acting nor creative talent participated). Several people were reminded of Pirandello’s Six Characters in Search of An Author, the struggle between the characters who know who they are, and the actors who fictionalize them – a meta level play about characters who are creating a play about themselves. Collected Stories has had a number of productions. Linda Lavin did two previous stage productions, and in 2002 a taped version for television. Uta Hagen – she, the great actress and teacher from the HB Acting Studio down the block from the White Horse Tavern – took the part of Ruth in 1998. The new production, running through June 13, 2010 is a thoroughly enjoyable and interesting revival of the play. Linda Lavin ages from scene to scene (from 1990 to 1996) and is pitch perfect at every age as Ruth. Sarah Paulson, one of my favorite actresses – recently in Studio 60 on the Sunset Strip and Cupid on TV – is sympathetic, harsh, intelligent, ruthless, principled, unprincipled, guileless and guilty all at once. If there are imperfections, it is that Linda Lavin is too perfect and Sarah Paulson must stretch, at the beginning, to be a young, naïve grad student with a predatory nature hidden beneath her obsequious behavior. The speech patterns seem at first to take rhythms that are too familiar, like Oleanna on the one hand, or Broadway comedy on the other. The scene -- where Lisa in bright lights at the lectern is giving a reading at the Y (the 92nd Street Y a real venue for "important" book talks) of her new novel (based on Ruth’s story), while almost in the dark on the other end of the stage, Ruth is eating, quietly, alone… -- is perfectly spooky. And the famous line -- when Lisa arrives at Ruth’s apartment (having "stolen" her story) to find the door chained, and asks, “Since when do you use a chain?” and Ruth responds “Only when I'm expecting burglars”… -- is brilliantly effective. This is an excellent revival of a classic American play. The stage design, the acting, the direction are all excellent. The issues raised in the play of personal relationships and artistic responsibility are timeless. And the play is funny, too. I've always liked the Firebird restaurant on 47th Street. It's a great place for an after-theater snack with caviar or zakuska (mixed Russian appetizers) and vodka. Every time I go there -- most recently a few days ago, after seeing Donald Margulies' excellent "Collected Stories" on Broadway (a block away)-- I've left happy. They have a wide selection of caviar, from the freshest salmon roe at a very reasonable price... to special caviars that will impress any VIC (Very Important Client) or VHD (Very Hot Date) and put a dent in even a hedge fund manager's wallet. I like their honey vodka. They also have their own ginger infused vodka, and a spicy horseradish infused vodka. It's a comfortable setting, complemented by excellent service. Lauren Bacall, Ben Gazzara and Olivia Thirlby in EVE. On location at the Firebird Restaurant. 10:57 AM -- Press conference is over. They do seem to be re-broadcating the archived event from time to time. Brilliantly directing, finding the joke in almost every line (sometimes more than one to a line) and laughs in many places without any lines at all, Stanley Tucci guides Lend Me A Tenor, an excellently written, wonderfully acted comedy, in a new revival on Broadway. Setup: A world famous Italian opera singer (a role that feels almost as if it were written for Paul Sorvino) comes to Cleveland to guest star at a major operatic benefit. He's late. He has overeaten. He is a womanizer. His (jealous) wife is with him. He's not prepared to sing. The Opera Manager's Assistant (intern as he'd be called in CL), a geek with no visible charisma or experience, and of course in love with the Manager's Daughter, is the only one who might sing the opera if the Tenor can not go on. Funny lines, plus slapstick and multiple-ladies-behind-swinging-doors farce. 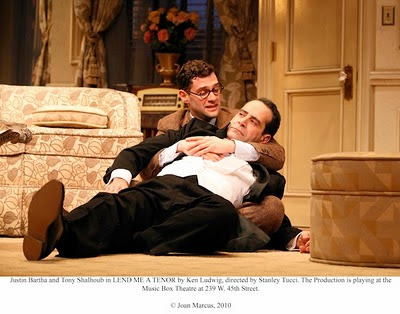 Written by Ken Ludwig, the play, set in 1934, was first produced in 1986. Now it's at the Music Box, one of the nicest theaters on Broadway. Tony Shalhoub as the General Manager, and Anthony LaPaglia as the Tenor are both excellent in verbal and physical comedy. 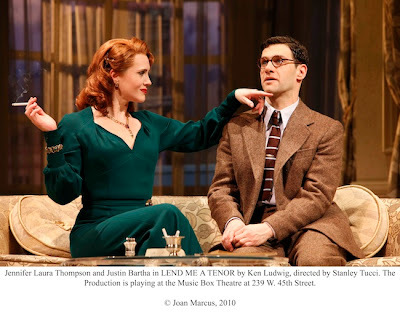 Jennifer Laura Thompson as a Singer/Diva is most desirable, and Jan Maxwell as the Tenor's Wife is very funny. But the standout star is Justin Bartha (best known as the future groom in The Hangover), making his Broadway debut! As the Assistant, Bartha transitions back and forth from geek to opera star, totally real and hilarious as both. It's very funny (did I say that?) and great fun!